HOUSTON--(BUSINESS WIRE)--The investments being made to Port Houston’s channel continue to pay off. As a result of the completion of the widening and deepening of its Bayport Channel and work on what’s known as the Bayport flare, Port Houston is seeing rapid growth in the size of ships calling its container facilities. Later this week, Port Houston is expected to receive its largest container ship to date, a 9500 twenty-foot equivalent (TEU) vessel Port Commission Chairman of the Port of Houston Authority Janiece Longoria announced Tuesday during the Port Commission regular meeting. “This is sign of the future for the container industry and we must continue to make the investments to handle these vessels of the next generation,” Chairman Longoria said as part of her announcement. Just last week, Port Houston received an 8450 TEU vessel to Bayport. As another example of the growing demand, in July the port recorded the largest number of container lifts on one vessel in its history at 4,800 lifts. That record has since been shattered twice, the latest being earlier this month when more than 5,700 container moves were handled on one of the port’s East Asian services. Several items acted on the agenda by the Port Commission further illustrated a commitment to investment to meet the port’s growing demand. They included the approval to accept a request for proposals to redevelop container yards at Barbours Cut Container Terminal; a recommendation to award the planning and design of the next phase of terminal development at Bayport; and a recommendation to construct the rail spur into the Bayport container facility. Port Houston concluded the month of August delivering strong results. Overall tonnage for the year at nearly 28 million tons reflects an 8 percent increase over last year. Steel tonnage remained steady through August, reflecting growth of 29 percent for the year. August container volume remained solid, but Executive Director Roger Guenther noted that comparisons to the same month last year at this time is skewed due to the effect of Hurricane Harvey with port operations closed for a week in August of 2017. However, year-to-date activity continues to be strong with a port-wide increase of 11 percent overall in TEU. Loaded container units are up 10 percent compared to last year. Port Houston alone handles more than two-thirds of all U.S. Gulf container traffic. With the growth in larger ships that depend upon Houston, the importance to highlight the needs for improvements required for the Houston Ship Channel are emphasized by Port Houston’s leadership. Before concluding, Chairman Longoria underscored some of the advocacy efforts given by Port Commission members, staff and herself to top leadership of the U.S. Army Corps of Engineers in the greater interests of the Houston Ship Channel to stress the requirements for widening and deepening of the busiest waterway in the nation to serve our industry and maintain efficient two way traffic. The next Port Commission meeting will be Oct. 30-- at 9:00 am. 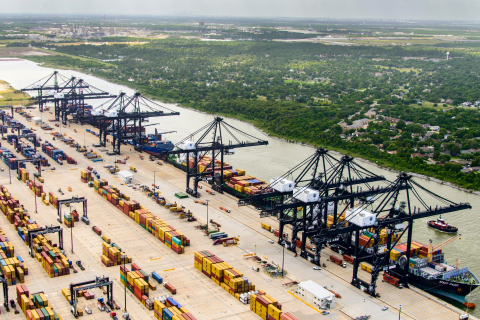 For more than 100 years, Port Houston has owned and operated the public wharves and terminals of the Port of Houston – the nation’s largest port for foreign waterborne tonnage and an essential economic engine for the Houston region, the state of Texas and the nation. It supports the creation of nearly 1.175 million jobs in Texas and 2.7 million jobs nationwide, and economic activity totaling almost $265 billion in Texas – 16 percent of Texas’ total gross domestic product – and more than $617 billion in economic impact across the nation. For more information, visit the port’s website at PortHouston.com.